Join our winning team! End government corruption and take back your community. 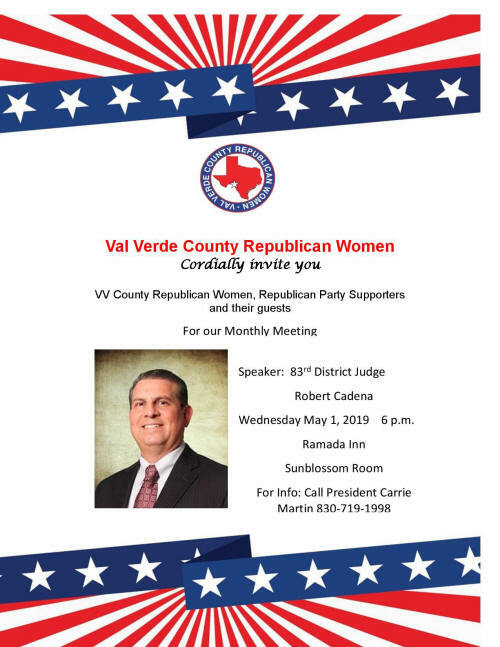 Meet the Val Verde County Republican Women! Thursday, May 9th 6-9pm, Dr Alma Arreddondo-Lynch at the Whitehead Memorial Museum. Meet and Greet BBQ fundraiser with Texas Music !! Thursday, JULY 4TH – Parade 9:00a.m. downtown and community outreach at evening community celebration We need more REPUBLICAN candidates in every election!! Please do not hesitate to contact our President if you are interested. Esther Chapoy and Carrie Martin are assisting in teaching English as part of the local Citizenship classes organized by the Mexican Consulate and the Libre Institute. We have genuine compassion for our country and seek to build a stronger, more patriotic America following our US Constitution and traditional American values. Your ideas are very important to us. Please do not hesitate to contact us at any time. Thank you for joining us and helping make a difference in our corner of this world. Join VV County Republican Women today! Dues are $30 per year, and spouses or interested gentlemen may join as associate members for $15 per year. You can be as active as you choose, all Republican minded community members are welcomed. Voting members are women who have paid their dues. The application form can be downloaded and printed. One application per person please. Do not hesitate to contact President Carrie Martin with your comments or concerns at any time at: blessedcmartin@gmail.com. Paid for by the Republican Party of Val Verde County Texas. Not authorized by any candidate or any candidate’s committee.